A8 Mobile, Search, Email advertising network details. 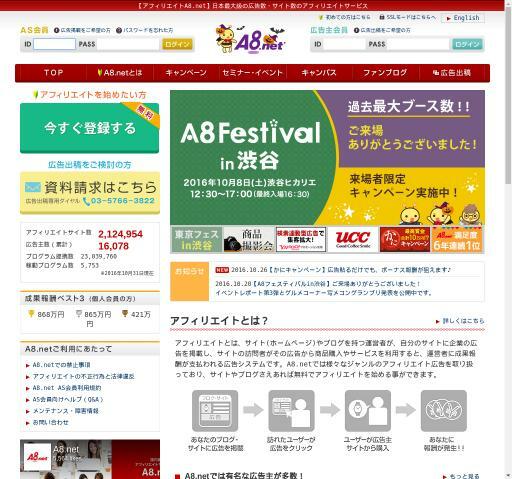 A8 is a Japanese affiliate ASP that has the highest number of media members and advertisers in Japan. They are the first when it comes to Affiliate Satisfaction for eight consecutive years now. Their team is constantly improving their services and techniques in order to provide the best user experience and to ensure one of the highest advertisement revenues. It’s easy to start earning an income with A8 and there is no mandatory need of a blog or website. Even if you don’t have any Web previous knowledge, you can use a fan blog for free. If you are wondering if the use A8 is expensive and if you will spend big amounts of money on the fees, A8 ensures 100% no additional costs. For additional information before registering in the A8 platform, see the Information section to find out what Pricing Models they offer and which are their Targeting Options.